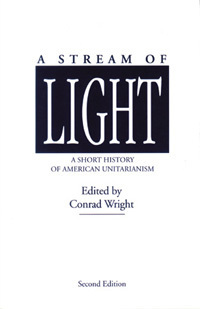 Unitarian thought from 1805 to 1961. Essential to any UU history library. The American Unitarian Association was organized on May 25, 1825. But first there had to be Channing's Baltimore Sermon in 1819; and before that, the dispute over the election of Henry Ware as Hollis Professor of Divinity in 1805, an event which has long been taken to have been the starting point of the Unitarian Controversy. Yet we cannot understand the history of American Unitarianism in the nineteenth century without looking back to the eighteenth, and even farther back than that. Unitarianism was not a sudden new creation in 1805. It was a product of the impact on New England Puritanism of the eighteenth-century currents of thought that we refer to, in shorthand expression, as the Enlightenment, or the Age of Reason. Before examining Unitarianism as a distinct religious movement, or denomination, we must remind ourselves of some of the continuities between it and the Puritanism from which it emerged. There were, first of all, doctrinal continuities. To be sure, it is easy to emphasize the points of discontinuity, where the liberals rejected the position of their orthodox parents or grandparents. The Puritans saw God first and foremost as sovereign and judge, and emphasized his righteous will in the condemnation of sinners; the liberals preferred to think of him as a loving father, with a benevolent concern for the salvation of all mankind. The Puritans saw unregenerate human nature as depraved, and corrupted by Adam's sin; the liberals saw it as having the capacity for righteousness as well as for sin, and insisted that what human beings do in this life will have a real bearing on their salvation. The Puritans believed that Scripture reveals a triune God; the liberals argued that the doctrine of the Trinity is both unscriptural and irrational. But the frame of reference within which all these issues were disputed was the reformed theology of the Westminster Confession. The liberals gave unorthodox answers, but the questions were not unorthodox questions. If the liberals were unorthodox in their responses, they were nevertheless quite orthodox in accepting those questions as the important ones that had to be addressed. This means that one of the most important factors in the shaping of Unitarianism was the theology of John Calvin. As between Calvin and Servetus, or Calvin and the Socini, who has had the greatest influence on American Unitarianism? Which one is the ancestor? Calvin, of course.